I make my cheesecake in classic New York style with a graham crust and cream cheese (not ricotta). It’s almost like a cream cheese custard, relying on eggs for its stability and just a sprinkling of flour as an afterthought. This makes it perfectly creamy, perfectly smooth, and oh so delicious. 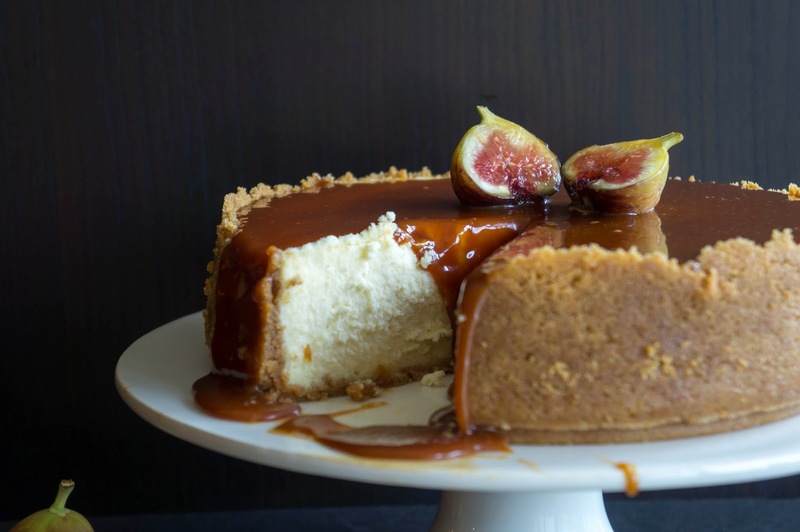 Because it’s winter, I decided to pair this cheesecake with a comforting caramel sauce. I first encountered the concept of burnt caramel when I was throwing my very first dinner party and I made some burnt caramel custards with sea salt. It’s a bit of a misnomer since the caramel isn’t really burnt yet. Burnt caramel would be black and extremely bitter. Instead, we take the caramel to the brink, deepening the flavour and adding a slight bitter note without ruining it. It’s a fine line, but it’s always better to take it off the heat earlier rather than later. You’ll still have a delicious caramel sauce! 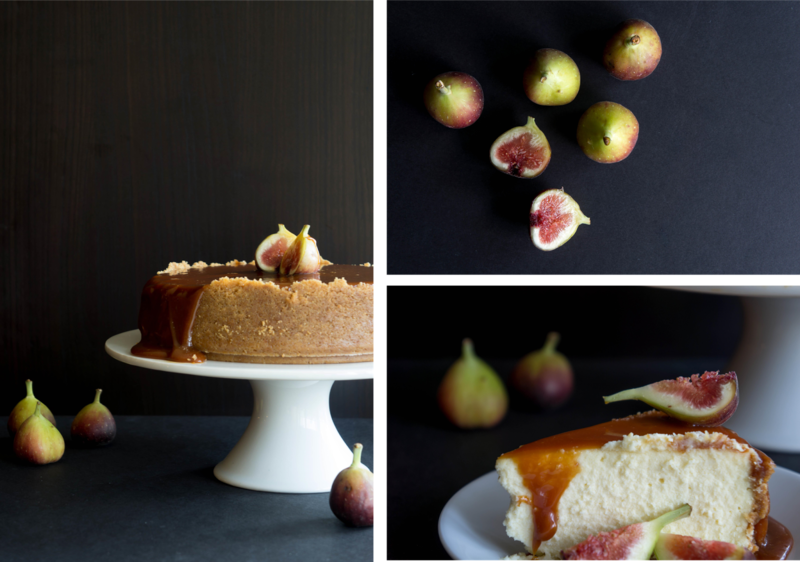 The figs were added partly because I love figs lately and partly because they add a little brightness to cut through all the sweetness. 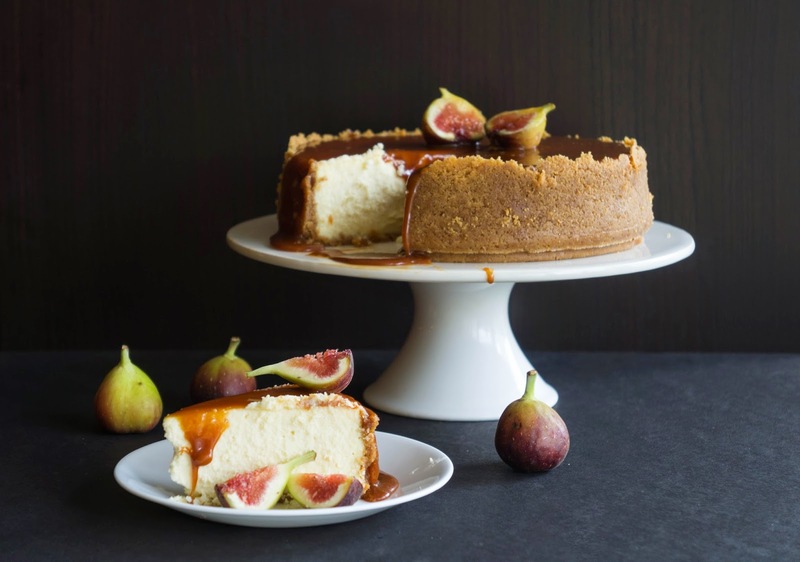 So make this cheesecake part of your New Year tradition! Everyone will thank you. Preheat the oven to 350F. Grease a 9 inch springform pan and place on top of a larger baking sheet to catch any leaks. I always get butter leaking out of mine, so this is important. Combine graham crumbs and 1/4 cup sugar in a bowl. Pour in melted butter and stir until crumbs are uniformly wet. Pat this “sandy” mixture on the bottom and as far up the sides of the prepared pan as you can. This often takes a lot of patting for me. Refrigerate the crust while you make the filling. In the bowl of your stand mixer or using a hand-held mixer, beat the cream cheese, butter, sugar, and flour until smooth and well combined, about 2 minutes. Add the eggs one at a time and beat until combined (about 30 seconds), scraping down the bowl between each addition. Scrape down the bowl one more time, add whipping cream and vanilla and beat until combined. Pour the filling into the prepared crust. If you weren’t able to get a high crust edge then the filling might go over it. It’s not the end of the world. You can either keep it as is, or baking the extra filling separately in ramekins for a shorter amount of time. They are still delicious! Bake in the middle of the preheated oven for 15 minutes, then reduce the temperature to 325F and bake for another 75-105 minutes. This depends highly on your oven, how wet your cream cheese was, the humidity so make sure to check often! You want the cheesecake to be just set, dry on top, with just a little wobble in the very center if you shake the pan. If you wait until it is completely set (and probably cracked on top) it will be dry and not as creamy. Remove from the oven and let cool completely inside the pan. 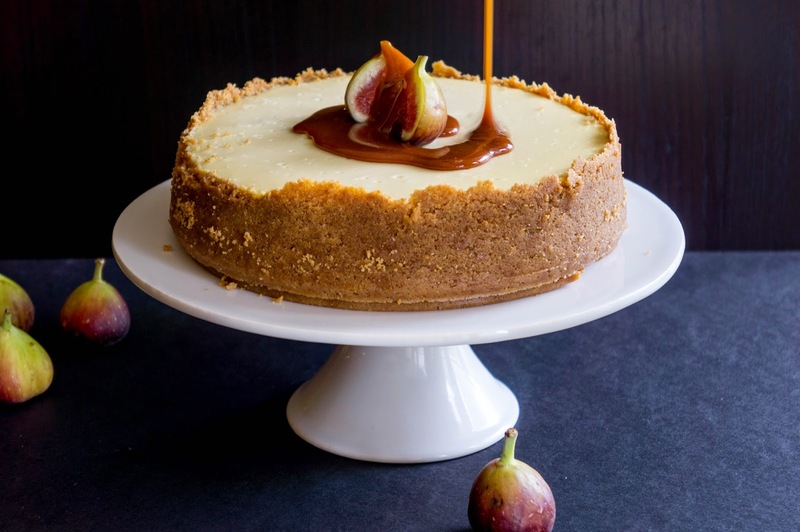 As it cools, you can run a knife around the edge to loosen the cheesecake and prevent the top from cracking as it tries to pull away from the sides. Once it is completely cool, refrigerate for several hours or overnight. You can take it out of the pan or leave it in. I usually make this cheesecake the day before I want to serve it so I have the whole night to refrigerate. 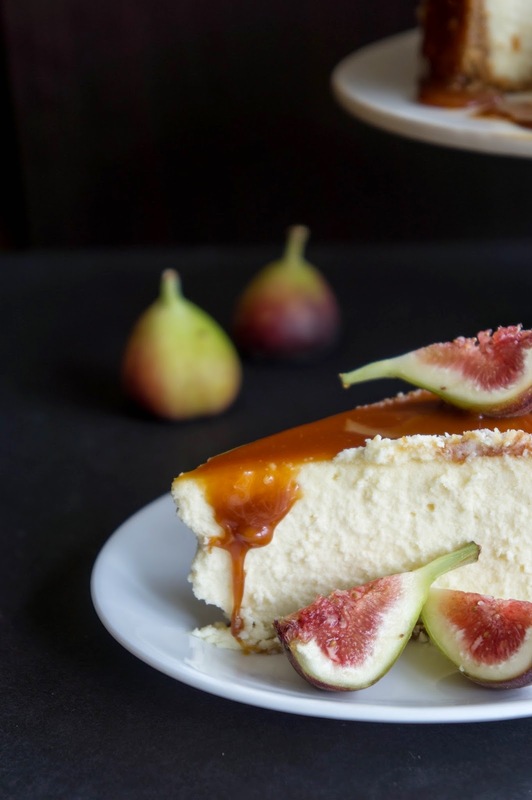 Serve with halved ripe figs and burnt caramel sauce (recipe follows). Have the cream and butter measured out and ready to go before you melt the sugar. In a medium, heavy bottomed (preferably even heating) saucepan, heat 1 cup of sugar over medium heat. Many people prefer to add some water when they are making caramel, but I find that I am more likely to get crystallization and a grainy mess if I do that, so I go with straight sugar. The sugar will start melting eventually (it takes a while!) and then I just lightly stir it around with a rubber spatula to try and get it evenly melted. If you stir too much it might form some hard lumps, but these should dissolve again. Just make sure you’re heating it slowly so they have time to dissolve before the rest of the sugar burns. Once the sugar is melted it will start to caramelize and darken. This is the tricky part. Wait until the caramel looks deep, deep amber, at the cusp of being burnt. Remove from the heat and carefully pour in the heavy cream while stirring vigorously. It will sizzle and steam, it might seize but keep stirring. If it is not coming together, put over low heat again and stir until it dissolves. Remove from heat and whisk in butter and salt. Pour over everything. 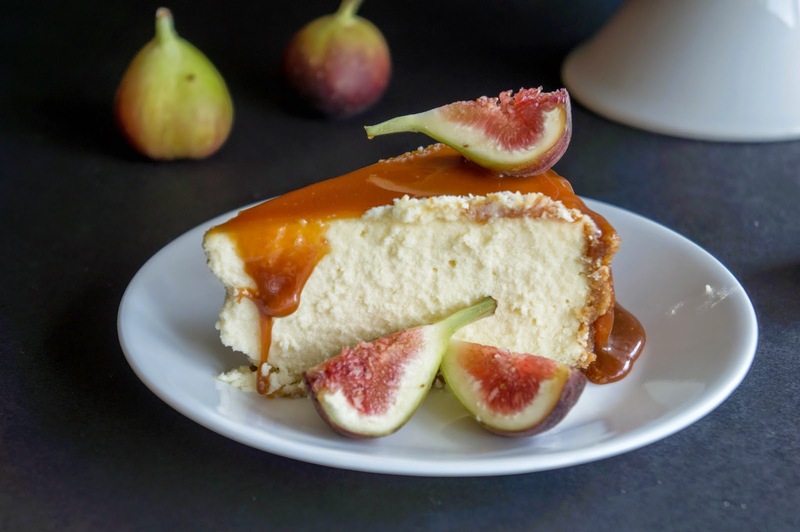 Figs are just my favourite thing ever.. so this cheesecake is an instant winner in my books. Wish I had a slice to devour right now! It's always a good time for cheesecake!